Thank you for the encouragement over this card - I didn't try to unpick but finished it off by sewing round the edge. It's now going off to my secret partner, so I thought I would show a little bit more of the place it is inspired by. We are lucky to have some beautiful beaches near us from which the island in my card, the Bass Rock, is visible from different sides as you travel down the coast. It is one of a group of islands/rocky outcrops, most of which are volcanic in origin.The top of it looks white because of an enormous colony of Northern Gannets. It always looks beautiful and fascinating whatever the weather, and these beaches are some of my favourite places to "get away from it all", which is the theme of this swap. Thank you to Ali for once again organising this lovely swap. It was a lot of fun making this card and I was so pleased when I found out who my secret partner was. It goes off with thanks for bloggy encouragement and enthusiasm! The Bass Rock: tiny Oakshott scraps, fused, and machine embroidered. The real island looks gorgeous and so does your card. We're lucky enough to live near beautiful beaches down at the other end of the UK too, and they're some of my favourite places to 'get away from it all' as well. The card is lovely, and perfectly meets the brief. I would never have guessed the colour of the cliff was due to a colony of gannets–the lighthouse must get very messy! Brilliant! Is all that white the birds or their droppings or both?!! Amazing. I think your card is fantastic. I love the colours and textures of the sea, and the added detail of the seagull. 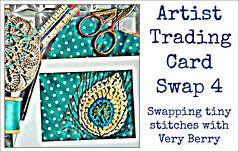 Your swap partner will be delighted I'm sure! Oh, that looks very neat! Lucky partner, it's beautiful. Your postcard looks amazing- love the close up shots. And what a picturesque place you live! I can really see the connection between the photos and the card you made. And the colors and shapes of the water are just beautiful! Miniature perfection! What a lovely theme for the swap too. Looks fantastic! I love the way you've done the water especially! I love it! I so regret not going for this round, though I would perhaps have been tearing out my hair. You did a super job!